I haven't been to FFH in a long time but I've had this mod on my radar for a couple months. I finally decided to dive in a week or two ago and have just finished Chapter 1. I gotta say, it was a huge treat. This is the closest thing to a FFT sequel I've yet to experience and I loved it! I was initially drawn in by the strange concept as all I knew was the fact that Link, Dante, and Snake were joining the game and I just had to see how that worked. I expected it to be kind of a silly lighthearted thing but from the get go I could tell my expectations were going to be surpassed. I had no previous knowledge going in and I just loved it from the Brave Story Journal on. Meeting these characters again and having them enter the story in an organic way one by one it was like catching up with old friends after so many years! 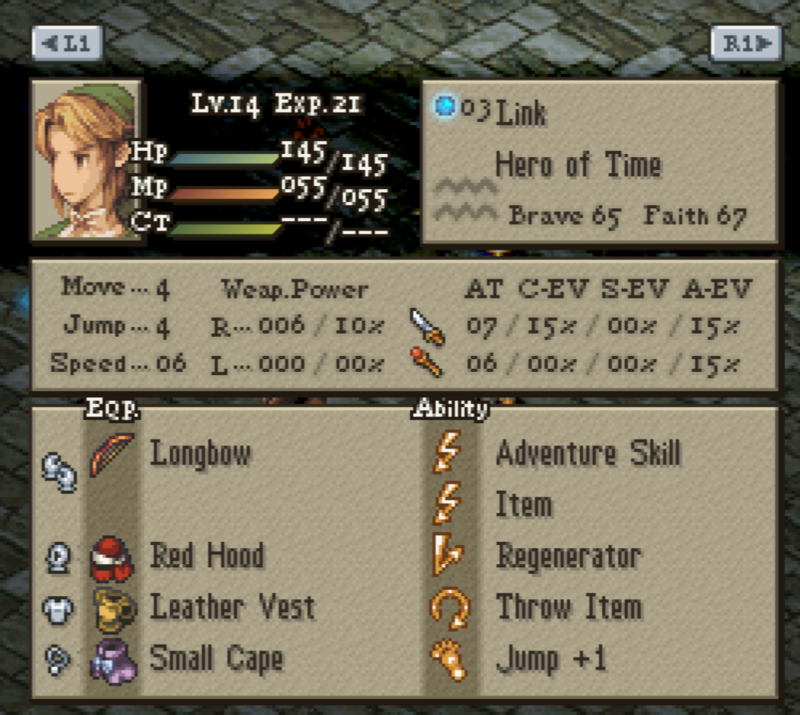 FFT is by far my favourite game ever, I've spent thousands upon thousands hours in the original and in 1.3, I can never truly move on from it but this was the freshest experience of playing FFT I've had in so long, so thank you again! As for the battles/gameplay itself, I thought it was pretty well balanced. I only ran into two tough spots, Sephiroth and then the final battle of Chapter 1 against the Dorfman. Sephiroth I was feeling was impossible until I realized you just had to damage him a bit to get the other allies to show up, after that it wasn't bad. Poison is so massively helpful against bosses in this game, he was no exception. I had the most trouble against the first iteration of Ganon in Besrodio's. It took forever to find a starting set up that let me get things going, but once I reconfigured my team and put Item on more people to just bum rush him [and got lucky with Mustadio Paralyzing and the like!] I was able to get it done. The MVPs were Poison from Ranger Snake and Cross Slash Immobilize stopping his Move HP Up. Once I took out his cronies things were smooth sailing. Only to move on to the next round! I tried it with the same set up and got trounced after Worker 8 showed up. So I reconfigured the team and managed to win after only 1 or 2 attempts, but it was a long hard slog! I couldn't believe when he revived that last time, I was ready to be done with him! Mustadio was largely useless for most of the battle, he would just fly back and forth following Ganon without getting close. Finally he unleashed 'Dispose' in what I think might have been scripted moves as they were key moments in the battle and I can't understand why he wasn't using it earlier if that wasn't the case. I was also quite surprised that I could bring an extra party member in the final battle - I only had one extra member, a level 8 Chocobo, but it actually ended up being really helpful as I let Cloud ride it, thinking I'd use it to keep him Immobilizing Ganon, but instead it had him Blade Beaming him as Cloud [and everyone else!] was near death for most of the battle. The MVPs of the final battle I'd say were Invigorate on Dante/Cloud for keeping people popping back up. Gunk Shot on Snake for nailing a couple Oil's on Ganon, and Asura wielding Dante hitting a few 100+ damage attacks capitalizing on Oil. 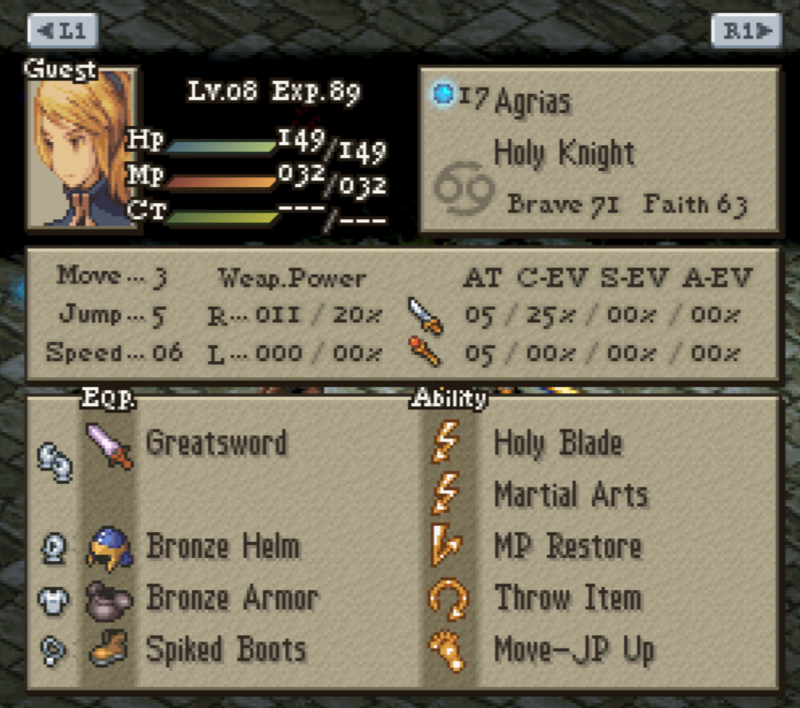 Agrias was largely useless except as a damage sink/distraction, I put Monk secondary on her and she just Chakra'd like crazy, she dealt a total of 0 damage to Ganon. Link was dead most of the time but did hit a few Ice Arrows, no Slow though. 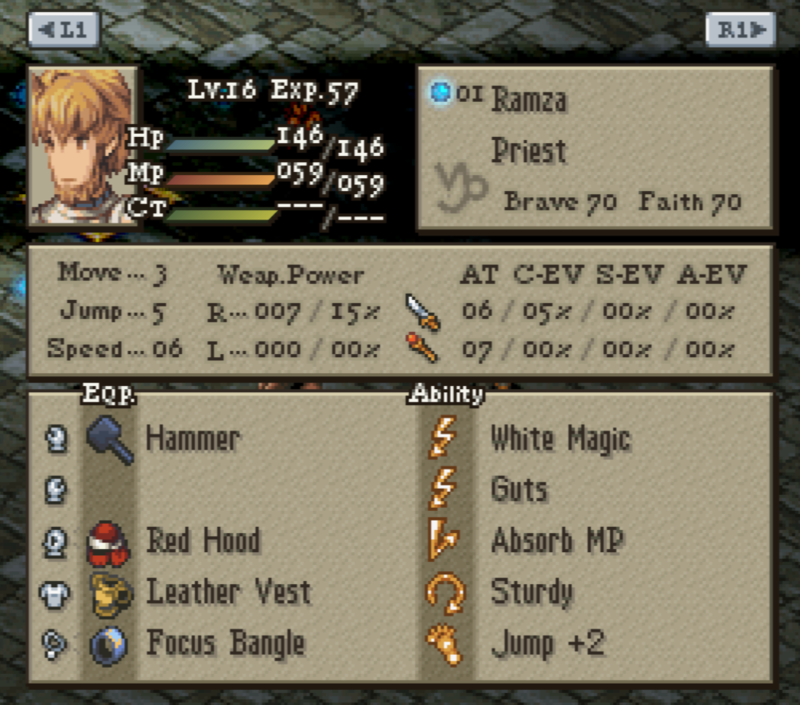 Ramza was support with White Magic/Guts, a few Shells, Regens, a Yell here and there, some Wishing/Encouraging. I like Ramza in this support role, it fits his character. Snake was an item bot when not Gunking. I was really hoping I could revive Zelda too and have her be a Guest but she was Teta'd. I'll post my final team in a second post, levels were 14-16 on the main Five and 8 for both Agrias/Chocobro. Gotta say I loved the new movesets and the diversity in each party member! Maybe I'll make a second post and give some general thoughts on each character too just to avoid this one being so massive. Thank you to everybody involved in this and those continuing to work on it! It was a real wonderful experience and I'm stoked to see it develop. Kudos especially for taking the wacky premise of these five coming together and blending there worlds into something that feels like a true FFT sequel! Thank you! I loved his skillset and how supportive it was, as I said above I felt it fit his character very well. I had Encourage, Heal, Cheer Up, Yell, and Wish in the final battle. - Encourage saw a ton of use, especially early on when MP and MP Restoration was not in abundance. But I still used it in the final battle a few times, mostly to fuel Dante the Death Machine. - Heal I don't think I ever really used. I picked it up when I saw how many monsters could apply statuses with attacks at a 100% rate, but yeah, just never used it. It might have seen more use if it had range? I dunno, in the end statuses weren't as big of a problem as I expected. 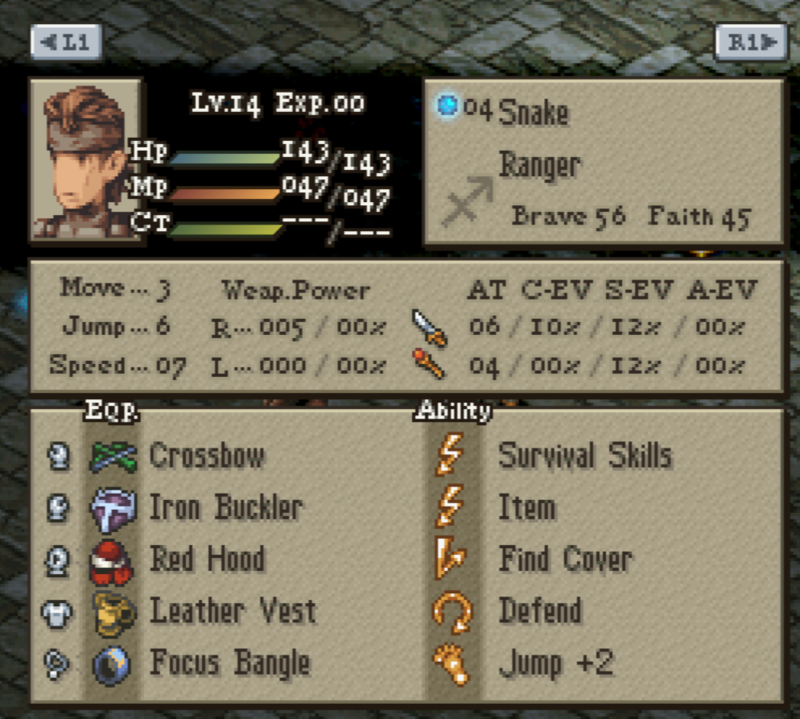 - Cheer Up I only used a few times, since I had Ramza as a Priest the group Regen was so much better, it definitely dwarfs this ability. - Yell was fun as always but with Speed at 6 for most party members it didn't last too long. 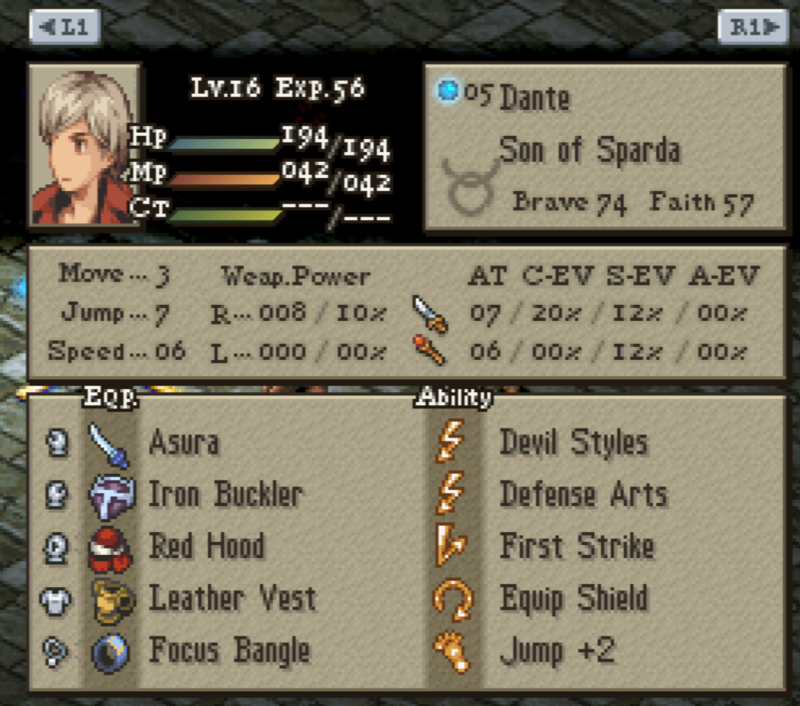 Still, some good use out of it on Cloud and Dante primarily to increase their DPS/Immobilize options. - Wish is amazing to me who hoards items [especially in this game with their price], I used it a buttload of times and it was fantastic. Instant, Ranged, 100% hit, pretty fantastic! 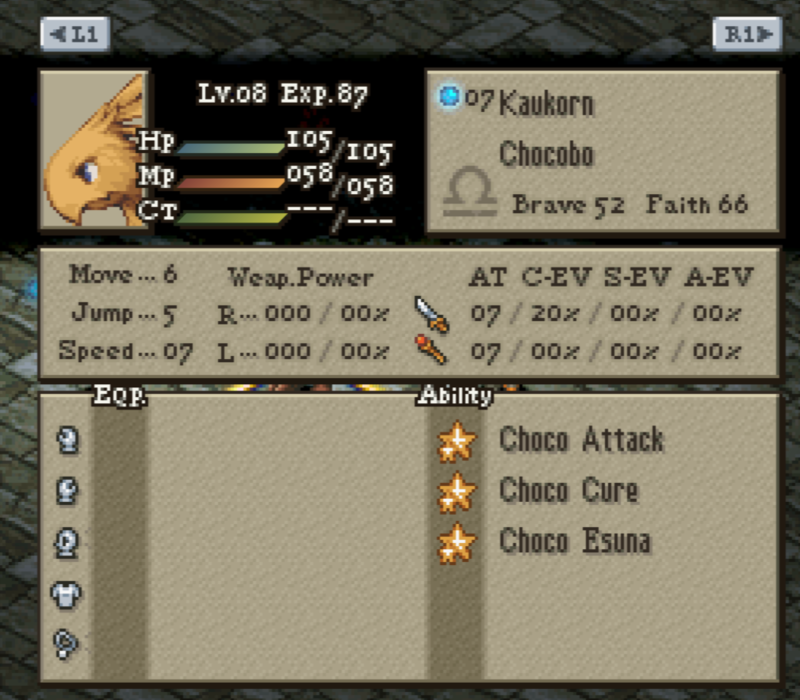 - Sturdy also never left him once I grabbed it, great ability on a support character to increase his survivability! I also had him delve into Priest and he had Cure, Regen, Protect and Shell for the final battle. Once he got some Priest abilities, especially Regen, he was so helpful! The large AOE on the status abilities and the fast cast time was fantastic. Regen was the MVP I'd say, what a great ability now that it also adds MP! Having him as a Priest was instrumental to victory. 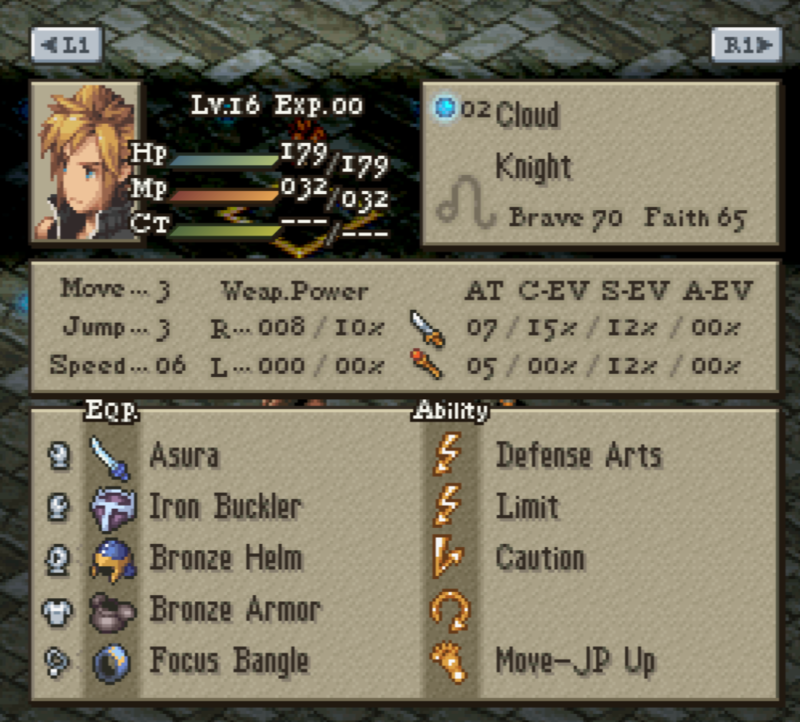 Cloud's Limit skills were massively useful. I had Braver, Cross-Slash, Blade Beam, and Meteorain in the end. Having no MP cost made the skills amazing, and the fast cast time meant I could usually nail enemies with them without fail. - Braver was a great damaging skill, when I wanted to make enemies hurt that was the go to. - Cross Slash was the MVP for sure. Against the big bosses, this couldn't be beat. Stopping them in their tracks at a 100% success rate [if it hits...] was key to beating the toughest battles, for sure. It made the big bads much more predictable as well. Cross Slash = 10/10. - Blade Beam was situationally great. It synergized really well with his Knight side job and Invigorate! As soon as he would pop back up he could rain some death down on enemies. - Meteorain unfortunately never really helped me out. I loved the massive AOE but the damage was too low and often I couldn't avoid hitting some allies. I don't think I used it in any tough battles, maybe at all. It was usually better just to wait and save some CT to get closer or to use a Knight skill. As I said Cloud was a Knight for me as a secondary. He ended up with all abilities EXCEPT Break Helmet/Armor. In the end though, I really only used Invigorate. But boy did I use it! What an ability. I feel it might almost be broken as using it on yourself pretty much heals the entire cost for a free reraise. Even on allies its range and instant cast and 100% success rate was just wonderful. I was using this ability all the time when Cloud wasn't using Braver or Cross Slash. Since he pops back up on Death and its basically free you can chain reraise for quite a while too to try and delay the enemy. Invirogate is top notch. Okay, I'm running out of typing endurance and I'm still stressed about my job interview tomorrow, so I'll just post a link to the other party members post final battle and maybe I'll come back and post thoughts on them soon! And, heh, if you think this was impressive, bear in mind that Jot5 Release is basically a rough draft of Ch. 1. There's quite a few things coming in the rerelease, and I say this as someone who's been mostly out of the loop for the last couple months. Just replace the wire Soldering irons are like 10 bucks if you don't already have one. I don't know which is the problem, though; the wire or the button? Using a screwdriver to short the power switch pins works 100% of the time, but the switch only about 1 for every 3 tries. If I HAD to guess, it's the button, and I'm not at all sure how to start replacing that properly. Hell, I pressed too hard on the CPU and bent several pins as my first action when I started putting the pieces together. I have a feature enabled that if the board is getting power, it will automatically power on. So to power off, I shutdown from Windows, kill the switch on the power supply, and flip it back when I'm ready for it to turn on again, and it automatically powers on. But I never actually turn my desktop off unless I'm changing hardware, and I like it to automatically come back on if there's a power outage. I know it has been a long journey and is a lengthy undertaking but your entire team seems well assembled and motivated which keeps me coming back to the site daily for updates. I haven't seen a recent progress update in some time and I'm respectfully asking what the rough projected time-frame is for the re-release? I understand that you don't have a static date yet (as I'm sure there's still work to be done), but any update would be great! Thanks to everyone involved, keep up the outstanding effort!